Chocolate is the best Medicine! This particular "Chocolate Prescription" Candy Bar is perfect for Hospitals, medical offices, rehab facilities, Visiting Nurses, etc. This prescription is sure to make anyone smile! Our "Prescription" Chocolate Wrappers are surrounded by the most delicious Belgian chocolate! Personalized your Chocolate Bar by adding the name of your recipient to the Candy Bar Wrapper. 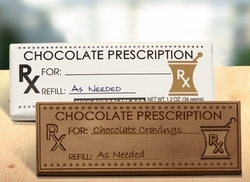 The chocolate is molded exactly the way you see it here, looking like an actual prescription, and we guarantee that the recipient will feel a whole lot better! Orders ship within 5 days or sooner!